Greger Strøm Special No. 1 of Trondheim, Norway. Greger's Nordic Special Racer was built in 1937. It attended one race at Leangbanen in 1937 where it beat Norwegian racing legend Arvid Johansen. Greger Strøm Special No. 2 of Trondheim, Norway. Greger's second Nordic Special Racer was built in 1938, while Greger was working at Gaden & Larsen in Trondheim. He raced it once at Leangbanen in 1938. The race at Leangen started good for Greger, but with around 100 metres left to the finish line, the throttle linkage broke, and he lost the race. It was a frustrating situation for Greger who was in it for the win. As with his first car, the Greger Strøm Special No. 2 was also parted after the race. The engine was sold, but Greger never got his money. Borrowed parts were returned, and the rest of the car was left rotting away. Nobody knows what became of the remaining parts of this race car. Ralph Lysell's Rally is a Norwegian bubble-top sports car built at Norwegian Aircraft Industries LTD in Oslo, Norway in 1951. The car was meant to be the first production sports car of Norway in the 1950s, but it never made it into production. 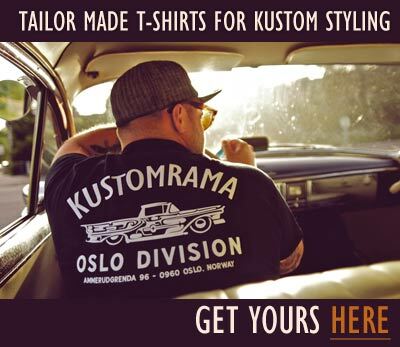 Show Your Support - Order Your Kustomrama Norway Division T-Shirt Today! Almar Nordhaug's Dream Car was built by Almar Nordhaug while working on the Faroe Islands in the 1950s. In 1957 Almar moved back to Norway, and he brought the futuristic car back home with him. This story about Hot Rods being the latest trend from the USA was printed in the Norwegian magazine Motor Avisen in March 1957. Per Røed's 1932 Ford Cabriolet as it appeared in 1958 when it was featured in Speed-Nytt 3/1958. Speed-Nytt named Per's cabriolet the first hot rod of Norway. Speed-Nytt 4/1958 ran a story on The Wildcat Motorclub, the first hot rod club of Norway. Three member of The Wildcat Motorclub working on their club car in 1958. Tore Tømmerås' 1935 Ford 5-Window Coupe can be seen in the back of the picture. From left, Bjørn Hoel, Terje Buaas and Erik Eriksen. Photo from Speed-Nytt 4/1958. Sten Johansen, Kåre Ask, Per Melbye and Tore Tømmerås posing in the engine compartment of Tore Tømmerås' 1935 Ford 5-Window Coupe. Photo from Speed-Nytt 4/1958. The design for the club car the members of The Wildcat Motorclub wanted to build. This drawing was published in Speed-Nytt 4/1958. Speed-Nytt journalist and car expert Birger Knutsen explaining the Wildcats member a thing or two. From left Terje Remberg, Harald Fjærvoll, Birger Knutsen, Bjørn Hoel and Tore Tømmerås. Photo from Speed-Nytt 4/1958. Tore Tømmerås' 1935 Ford 5-Window Coupe was built in Oslo in the late 1950s and it is one of the first hot rods of Norway. A newspaper clipping from Halden Arbeiderblad Saturday, March 26, 1960, announcing the formation of a new car club in Oslo called Speed Cars Club. The newly formed club was dedicated to "Speedcars" and Hot Rods. One of the first known custom cars of Norway is Per Ivar Kolgrov's 1948 Mercury Convertible of Oslo. It was a local sensation when this car passed inspection in the early 1960s. Leif "Basse" Hveem's 1933 Ford 5-window coupe. Viking Custom member Jan Erik "Smørbukk" Kvernes of Oslo bought the car from Basse's widow in the mid 1960s, and it was one of the project cars being worked on in the Viking Custom club garage at Alnabru. Jens Birkedal's 1934 Ford Roadster. Jens was the first hot rodder of Oslo installing an overhead valve engine in a hot rod as he installed a 283 Chevrolet V-8 in his roadster. Viking Custom member Per Arne Knudsen working on his 1934 Ford Cabriolet. The photo was taken sometime between 1966 and 1969, outside a garage Per Arne and Roar Arnegaard rented at Alnabru in Oslo. Photo courtesy of Per Arne Knudsen. An customized 1955 or 1956 Ford photographed in Oslo around 1967 - 1968. Gunnar Berg Kristoffersen spotted the car in Sørkedalsveien, Majorstua at a fenced property where the vehicle licensing department stored cars they had towed in or confiscated. As a hot rod and custom interested teenager Gunnar was very excited about the customized American car, so he jumped the fence and took a photo of it. In 2015 Gunnar told Kustomrama that he believed the car was pink, purple or light green metallic. If you recognize this car, please get in touch with us at mail@kustomrama.com. Photo courtesy of Gunnar Berg Kristoffersen. Åge Gustavsen's 1956 Ford Crown Victoria pick up of Halden, Norway. The build was completed in 1970. Espen Volle's 1957 Plymouth Plaza of Oslo, Norway. The Plymouth was Espen's first car, and he bought it in 1973, when he was 16 years old. The car was mildly customized and fit with a 1957 DeSoto front end before Espen sold it in 1974. Eldon E. Schmidt's 1929 Ford Model A roadster of Garden Grove, California. Eldon bought the car in 1960. It came with holes in the body after a rollbar and safety-belts, indicating that it had been raced on the dragstrip. In 1962 he installed a 1958 Chevrolet 283 V-8 engine in the car before he gave it a Metallic paint job and a more contemporary look. Ulf Haugen of Tønsberg, Norway bought the old hot rod from Sweden in 1995. Tom Carroll's 1949 Chevrolet was bought and imported by Sondre Kvipt of Oslo in 2009. The car was restyled by Barris Kustoms in the mid 1950s, and it is the first known Barris Kustom of Norway. Lawrence Garrison's 1940 Mercury Convertible was sold to Norway in 2011. In 2008 Eirik Bøle of Asker, Norway bought the Rally and restored it back to its 1950s configuration. Tom Røine's 1963 Buick of Oslo, Norway. Tom is a member of the Coupe Devils car club, and his Buick received a gold metalflake paint job in May of 2014. Lee A. Jagla's 1923 Ford Model T Roadster Pick Up of Hayward, California. Lee was a member of the Hayward V-Eights car club, and the Model T was a high school graduation gift from his parents in 1960. In 2014 the old hot rod was sold to Jon Aksel Lier of Tønsberg, Norway. Sondre Kvipt's 1957 Ford Ranchero of Oslo, Norway. Restyled by Olav and Sondre Kvipt of Kustomrama, the car is a tribute to Jerry DeVito's 1957 Ford Fairlane, known as the Maze. Sondre's Ranchero, known as the Kustomrama Dream Truck was completed in the Summer of 2015. Gil Ayala's 1955 Ford Thunderbird of East Los Angeles, California. Known as the Wild Bird, the car was restyled by Gil and Al Ayala at Gil's Auto Body Works. The first version was completed in 1956. In April of 2017 Yaril's Customs completed a restoration of the car for Bjørn Inge Jansson of Oslo, Norway. Tom Røine's 1956 Plymouth of Oslo, Norway. Tom is a member of the Coupe Devils car club. Named "The Creature," the build was completed in the Summer of 2017. February 25, 1912 the first automobile ice-race was organized in Norway. It found place at Bundefjorden outside of Oslo. The race received massive coverage in the news, and extra trains were set up to carry curious people to the event. As the crowds grew, the race turned into a chaos, and the racers had a hard time seing the track. The public were all over the place, and several accidents happened. The organizers eventually decided to cancel the race before it was over due to all the chaos, and public and racers had to leave the ice. The next day, the newspapers wrote about the race as a total failure, and it would take 10 years until the next official ice race was organized in Norway. In 1922 Gjersjøløpet was held at Tyrigrava outside of Oslo. Gjersjøløpet was also an ice race, and it was held from 1922 to 1939. In 1932 they had to move the race to Mjøsa by Lillehammer due to thin and unstable ice in the Oslo area. After WWII you needed a special permit to buy cars in Norway, as the Norwegian government wanted to reduce consumption of imported goods. As a result of this, there were only 18 cars per thousand citizen in Norway in 1948. If you already owned a car, you had restrictions when it came to mileage. There were also periods when it was forbidden to use a car. Automobiles were luxury in Norway during this time. When you crossed the border to Sweden, there were several used car dealers, ranging from small to large. Båstnäs was one of the largest. They all had Norwegians as customers. 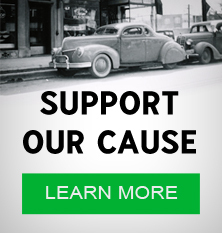 Parts were sold so people could repair and upgrade their pre-war cars. According to the book I grenseland. Bildrømmer på 1950-tallet, thousands of used cars were also bought on the Swedish side of the border. These were dis-assembled before they were brought across the border and assembled again in Norway. In the early 1950s, Swedish born industrial designer Ralph Lysell built a prototype for a bubble-topped sports car at Norwegian Aircraft Industries LTD at Fornebu, the main airport of Norway, located just outside of Oslo. The car was designed by Ralph, and it was meant to be the first Norwegian produced sports car of the 1950s. During the period of 1950 - 1951 at least three, but maybe as many as five cars were built at Norwegian Aircraft Industries LTD in Oslo. In addition to Ralph's dream car, at least two more cars were started as prototypes for production cars. Bergen is a city and municipality in Hordaland on the west coast of Norway. One of the earliest custom cars of Bergen can be traced back to 1951 or 1952, when Alf Rasmussen bought a chopped, channeled and sectioned 1936 Ford from a British or American pilot that had worked in the Independent Norwegian Brigade Group in Germany after WWII. The car was sold in 1955, and nobody knows what became of it. Some homemade cars were also built and registered in Norway in the 1950s. One of these were Almar Nordhaug's Dream Car. Almar built his dream car while working at a barrel company in Tórshavn on the Faroe Island. He moved back to Norway in 1957, and brought the car with him. 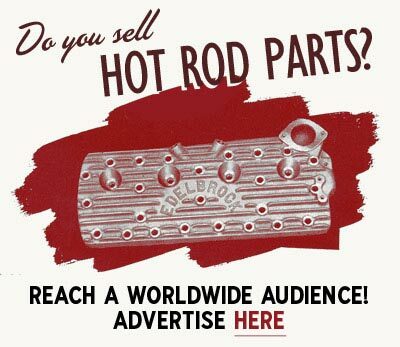 It took about 10 years from the first Hot Rod Magazine first hit the newsstands, to the hot rod movement of Southern California reached the coast of Norway. In the 1950s and 1960s american small size hot rod and custom magazines were sold at various newsstands in the biggest cities of Norway. These were the main source of inspiration for Norwegian teenagers wanting to build and drive hot rods. There were plenty of cars to base a build on, but getting the right parts, tools and equipment were almost impossible. In March of 1957 the Norwegian magazine Motor Avisen wrote a story about hot rods, the latest trend from USA. At the time Norwegian gearheads living Oslo used to hang out at Kontraskjæret, playing music, showing off for the girls, cruising cars and dreaming about owning a modified car such as a hot rod or a custom. In 1958, a year after Motor Avisen had written about the hot rod trend in the United States, Speed-Nytt 3/1958 followed up with a featured story on Per Røed's 1932 Ford Cabriolet of Oslo, Norway. Per's cabriolet was powered by a 1939 Ford V-8 engine that had been hopped up by shaving the heads. Speed-Nytt named Per's Ford "The First Hot Rod of Norway". Tore Tømmerås read the story on Per's Ford the same day as the magazine hit the stands. He immediately called the editors of Speed-Nytt to tell them about a club he and two friends had just started. Speed-Nytt paid the teenagers of Frogner in Oslo a visit, and in the next issue of Speed-Nytt gear headed teenagers of Norway could read all about The Wildcat Motorclub, "Norway's First Hot Rod Club". Oslo was the hotbed for the continuously growing hot rod and custom movement of Norway, and it didn't take long time before another hot rod club was established in Oslo. Oslo Hot Rod Klubb, located further downtown was founded later on in 1958. According to an article by Amcar Magazine on Drag-Racing in Norway, Per Ivar Kolgrov and "Endre" were members of Oslo Hot Rod Klubb. a. The weight of the cars, minus the weight of the ballast, gas and driver. b. The height from the ground to the highest point of the car, minus antennas, flag-poles and other accessories. c. The number of cylinders: 4,6 or 8. Straight or V-shaped engines should compete in the same classes. An additional class was also formed for engines with more than 8 cylinders. The dragstrip was also specified during the meeting, and the members of both clubs agreed about having a relatively short dragstrip compared to the shutdown area. By having a long shutdown area, the racers could have as fast as speed as possible when they crossed the finish-line. Good acceleration was therefore important if you wanted to win. The long shutdown area was necessary due to the high speed. A short shutdown area could result in damaged parts on the old cars due to hard braking. Two cars could race head on. The length of the dragstrip was set to be about 405 meters. Unfortunately the Drag-Racing dreams never came through for the young boys. Eager for speed, ice and dirt-track racing became their only alternative. Both The Wildcat Motorclub and Oslo Hot Rod Klubb were short-lived club attempts. As the members grew an interest in girls, it became hard to maintain the weekly club nights, and both clubs faded slowly out. The boys kept their cars and used them regularly, but by the early 1960s both clubs were history. In 1960 the rationing of cars in Norway was removed, and normal citizens were allowed to buy cars again. When it comes to building hot rods and customs, Sweden was way ahead of Norway. 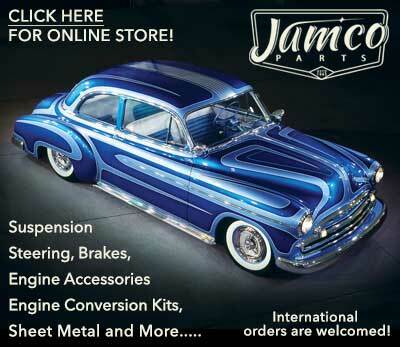 Just as in Norway, the Swedish traditional hot rod and custom scene can be traced back to the late 1950s. Many more cars were built in Sweden though, and it is apparent that the cars built in Norway in the 1960s were very influenced by the Swedish style. One of the first known custom cars of Norway was Per Ivar Kolgrov's 1948 Mercury. According to Roar Arnegård, it was quite a sensation when Per Ivar got his heavily modified Mercury through the licensing department in the mid 1960s. Oslo was still the hotbed when it came to Norwegian hot rods and kustoms in the 1960s, but things were going on in other cities as well, such as Trondheim, were Einar Valsjø was busy customizing his 1952 Mercury. Einar's Mercury was completed around 1963. Oslo Hot Rod Klubb and The Wildcat Motorclub were both short-lived club attempts, but they left impressions on other teenagers in Oslo such as Per Arne Knudsen and Roar Arnegård. In 1964 Per Arne and Roar decided to form a new club called Viking Custom. In order to find out if there were other hot rod interested teenagers in Norway interested in forming a club, Per Arne and Roar ran a classified in the Swedish magazine Start & Speed. 14 years old Gunnar Berg-Kristoffersen answered the ad and attended the first club meeting. He was told to take the tram to the church of Gamlebyen in Oslo, as the meeting was held at Per Arne's home at Alnafet street, close to the church. Present at the first meeting was Per Arne, Roar and other teens that dreamed about owning a hot rod. Being a serious club, Viking Custom had their own logo and newsletter. When it came to cars, Per Arne owned several cars, but his under progress hot rod project was a 1934 Ford cabriolet that he had traded for a stock 1923 Ford Model-T. Roar owned a 1933 Ford roadster with 4 or 5 friends. The roadster had been imported from the United States, and both set of to turn these stockers into real hot rods as they had seen in Hot Rod Magazine. Roar's car was rumored to be an old Police car, and the police stars were still visible on the doors. Kjell Trellevik is a hot rod and custom pioneer from the west coast of Norway. Kjell was born and raised in Bergen. In 1959 he moved to Gothenburg, Sweden where he first was exposed for mildly restyled customs. In Sweden Kjell bought a Ford Crown Victoria that he began restyling; "I had big plans for that car, but I didn't have much time to work on it before I moved back to Norway in 1961," Kjell told Sondre Kvipt of Kustomrama in 2017. Back in Bergen, Kjell bought a 1940 Ford that he started hot rodding. "There was a small scene for restyled cars in Bergen back in those days. In addition to my 1940 Ford, my buddy Torolf Viken had a hot rodded 1939 Chevrolet Coupe with a Buick V-8 engine. There was also a 1940 Oldsmobile coupe, a 1939 Studebaker coupe, and a Buick coupe." Kjell believes that he and Torolf had the first hot rods in Bergen. In the Autumn of 1965 Harald Sannum of Trondheim began restyling his 1959 Chevrolet Impala. In 1967 Harald's Impala was the first Norwegian custom to be displayed at Bosse Gamen's Hot Rod Show in Stockholm. During the Summer of 1971, Ludvig Bjørnstad was ready to test run his 1934 Ford cabriolet at the old airstrip at Gardermoen. In May of 1972 he made his debut run with the '34 at the dragstrip in Mantorp, Sweden. Fred Larsen was also present at the same event, racing his Funny Car Hot Lemon, and the two friends became the first Norwegians ever to compete with cars in an organized drag race. Ludvig raced in the Street Altered class, and he ended up as runner up in his class. There were still some enthusiasts left customizing cars in Norway in the 1970s. Their choice of vehicles were often muscle cars, and the restyling consisted mainly of custom paint jobs and interiors. The engines were hopped up, aluminum wheels were installed, and the cars were often raised in the rear. In 1974 American Car Club of Trondheim held an American-only car show in Nidarøhallen, Trondheim named Motormesseshow. The 1974 Motormesseshow was the first US-car show of Norway. Early custom pioneer Einar Valsjø attended the show with his customized 1968 Oldsmobile Cutlass Convertible. The build was completed the night before the show, and it was the first car of Norway featuring a show car paint job. In the 1980s, Norwegian enthusiasts such as Levi Lundring began to build traditionally styled hot rods and customs in Norway. The inspiration came from a growing revival trend in the United States lead by clubs such as the Shifters of So. Cal, and not the Norwegian hot rod and custom movement of the 1950s and 1960s. In the late 1990s a club dedicated to traditional hot rods and customs called Satelloids was established in the Tønsberg area. In 2000, another club, called the Coupe Devils car club of Norway was established by Sondre Kvipt, Kjetil Kvipt and Ole Kristian Espeland in Bø i Telemark. The club consisted of members from Fyresdal, Seljord and Sandeford, and the club was limited to traditionally restyled hot rods and customs American made cars prior to 1962. Many clubs followed, and many have come and gone over the years. Subscribe to our newsletter and receive updates on Norway and other subjects featured on Kustomrama. If you have additional information, photos, feedback or corrections about Norway, please get in touch with Kustomrama at: mail@kustomrama.com. This page was last edited on 10 October 2018, at 22:31.